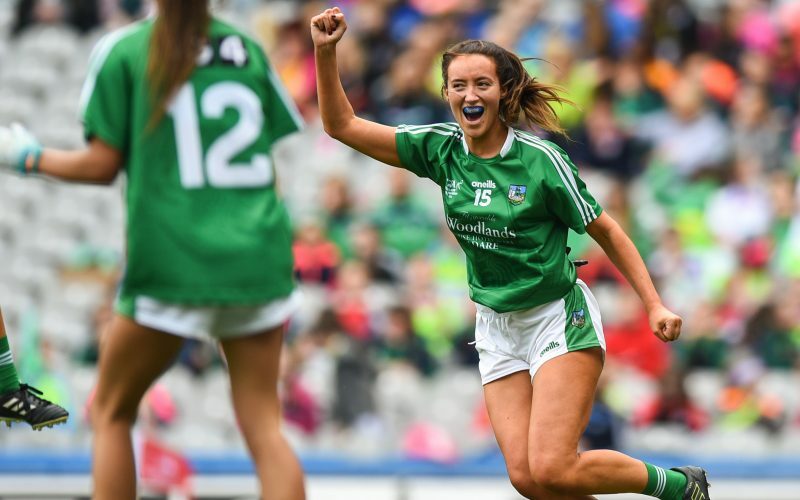 A hat-trick in a seven-minute spell provided the foundations for Limerick to take their first TG4 All-Ireland Ladies Junior Football title since 2010, with a 5-6 to 0-8 win over Louth at Croke Park. Despite Louth dominating possession in the opening stages and creating most of the early pressure, the Wee County failed to make that dominance count on the scoreboard. Aiming for their second title at this level in four years, Louth opened the scoring thanks to a sixth minute pointed free from captain Kate Flood. Although Limerick’s opener didn’t arrive until seven minutes later through Catríona Davis, it wasn’t for a lack of attacking pressure, with Limerick registering three wides at this stage, with Louth also forced to defend hard at the back. Once the Shannonsiders claimed their opening goal from Maireád Kavanagh there was no looking back for John Ryan’s charges. Kavanagh finished as top-scorer over the hour, with 2-2, with the St. Ailbe’s player and her Feroghanagh-Castlemahon colleague Rebecca Delee in strong form. Davis fired wide, before combining with Kavanagh who sent a powerful shot towards the goals, coming off the finger-tips off Louth defender Eimear Murray. Limerick were constantly bearing down on the Louth’s goals at this stage, with Kavanagh adding a point, before turning provider for TG4 Player of the Match Delee to smash home Limerick’s second goal. The hat-trick was completed 90 seconds later by Kavanagh, after a Davis free was played inside, and with seven minutes to go to the break, Limerick led 3-2 to 0-1. Louth worked hard to engineer a score before the interval, but it failed to come, with efforts going wide frfom captain Kate Flood and Lauren Boylem while at the opposite end Ceire Nolan was among those trying hard. On the restart, it once again took the sides a while to get going with almost eight minutes elapsed before the first score of the second half. This was Louth’s best period of the game, as they fired off three points in a row in determined fashion, two back-to-back from Flood, before a Boyle effort cut the gap to seven points 10 minutes into the half. But Louth were again met by a Limerick goal onslaught, with both Clíona Ní Cheallaigh and Delee finding the net inside a 60-second spell. Ní Cheallaigh put on huge pressure, and while the Mungret St Pauls player had two initial efforts blocked by Murray and Louth keeper Una Pearson, before finishing home. Limerick kept up the pressure, with Cathy Mee sending the ball in as Delee used her strength to send the ball to the net with a well-worked score. The sides were well matched in the closing quarter, with the sides trading points on three occasions between the 49th and 56th minutes – Lauren Boyle with all of the Louth scores. Both teams emptied their benches with Limerick’s lone All-Star Dympna O’Brien among those featuring, and the Gerald Griffins player had the final say of this game, after fellow substitute Caroline Hickey provided the pass, for O’Brien to take Limerick’s final score in the closing minute. After the game LGFA President Marie Hickey presented Limerick captain Cathy Mee with the West County Hotel Cup, while TG4 Head of Sport Ronán Ó Coisdealbha presented Rebecca Delee with the Player of the Match award. Scorers for Limerick: M Kavanagh 2-2, R Delee 2-1, C Ní Cheallaigh 1-0, D O’Brien 0-2, C Davis 0-1 (0-1f). LIMERICK: M Giltenane; A Hartigan, S O’Sullivan, K Reidy; A McGrath, N Ryan, C Mee; M O’Shea, L Hanley; R Ambrose, R Delee, C Ní Cheallaigh; O Giltenane, C Davis, M Kavanagh. Subs: K Heelan for Davis (39), C Hickey for Ní Cheallaigh (46), D O’Brien for Ambrose (50), M Walsh for O’Sullivan (55), K Geary for McGrath (57). LOUTH: U Pearson; M McMahon, E Murray, S McLoughlin; A Russell, E Byrne, C Nolan; R Carr, S Woods; J McGuinness, K Flood, N Rice; L Boyle, B Fleming, A Breen. Subs: R Kavanagh for McGuinness (45), E Hand for Murray (50), M McArdle for Byrne (58).